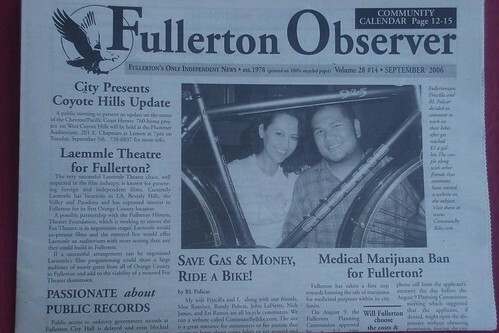 I wrote an article for the local newspaper, The Fullerton Observer regarding saving money and riding bikes. The editor told me she liked it but I didn’t realize that she would place it on the front page! commutebybike.com was thoroughly mentioned in the article. Once I get the PDF of the issue, I’ll post it. Dude, that’s awesome! Funny thing is, I didn’t know that you have written to the editor (see my previous post). Great job! Man, all you guys making the front page of the news paper. I should get yours, Priscilla’s, and Moe’s autograph before it would cost me too much. GREAT JOB! Ok, please, just admit it… Your initials are R.L. , you get RedLine some prime product placement on the front page of this newspaper… Come on, you work for Redline, right RL? —haha, just kidding.. Very nice work! Congratulations! Did you get compensated for writing the article? If not, great P.R.!!! Did you see they have a ban on medical weed…. ohhh no. ohh thats not the article i was supposed to see. the editor of the fo never writes. isnt that strange?